This plan for a record company is quite detailed. The company plans to produce artists on four separate record labels. These labels cover a broad spectrum of the music industry, from Jazz, to Contemporary Christian music, to Rock. The company already has established ties to various artists in the industry, and plans to search for new artists to market and produce. Reed Entertainment Corp. (REC) will capitalize on the growing entertainment market across the world through the production and promotion of high quality entertainment. Located in Henderson, Nevada, the company will become highly profitable through the sale of pre-recorded music product (compact discs/cassettes), in addition to revenues generated from ancillary profit centers. REC will own and control the masters (master copies), copyrights and licenses of its product, which will enable REC to create immediate revenue streams while growing its music catalog into a multi-million dollar asset. REC's Chairman, Samson Rama, has created, produced and marketed over thirty albums throughout his career. These albums have generated over $100 million in revenue for such companies as Rexmark, Connor, Emblem, Regal and Coastal Records. A variety of these projects have surpassed the "Gold" (500,000) and "Platinum" (1,000,000) sales levels and earned industry recognition through Grammy Awards, Soul Train Awards, Stellar Awards and GMWA Awards. A plethora of other projects have been used by major networks and companies such as JBN, RXK, CSC, Rexmark Pictures and Bloomfield Entertainment. REC has formed an experienced, award-winning management team. As artists, producers and executives, projects produced by these individuals have topped Billboard's Charts, earned nominations for Grammy's and Stellar Awards, while selling over two million copies. The years of experience maintained in both the business and creative sides of record company operations will enable REC to generate profitable revenue immediately. REC maintains strong affiliations in the music industry. Through relationships with industry legends such as Calvin Roberts (Roberts Music), and Wellman Jax (JAX), REC has been offered international distribution with Rexmark Ultimate (a distribution arm of Rexmark) and the Johnson Group. This provides REC the opportunity to generate revenue from the world's largest music markets including Japan, Germany, the United Kingdom and South America. The company has established four record labels to handle a variety of music genres including Pop, Rhythm & Blues, Alternative Rock, Jazz, Gospel, Urban and New Adult Contemporary. REC has compiled an exciting and diverse roster of recording artists. Selected over the past year, these highly talented veteran and debuting artists will enable REC to quickly penetrate the music marketplace. REC will distinguish itself from other independent record companies through its marketing and promotional plan. Intense, calculated and relentless promotional campaigns will enable REC to earn massive revenues through the growing popularity of "singles", as well as, traditional full-length albums. REC will utilize the success of its pre-recorded music to develop profit centers in independent distribution, merchandise and concert promotion. 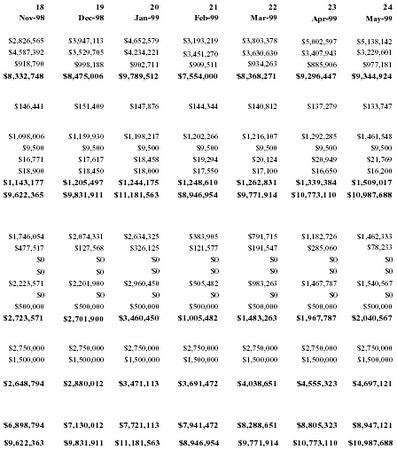 Based on conservative revenue projections, REC will generate over $5.7 million in sales revenue throughout fiscal 1997-1998, and $26.3 million in 1998-1999. REC will reach positive cash flow in the twenty-third month of operations while netting profits of $4.5 million in 1998-1999 and $6.6 million in 1999-2000. REC's founders are seeking $4.5 million in equity investment capital for this exciting company. These funds will be used to: a) establish corporate offices, b) maintain overhead expenses, c) acquire and secure artists, d) fund project production budgets, e) fund multi-faceted marketing and promotion budgets. A staged infusion of capital over the course of the first 10 months of operations will provide REC with the necessary financial resources. A linked offering composed of common stock, preferred stock and debentures is being offered by REC. As REC reaches the aforementioned levels of profitability, several lucrative exit scenarios become realistic including the opportunity to be acquired by a major record company and, depending on investor preferences, the ability to liquidate ownership positions. Reed Entertainment Corp. is a multimedia entertainment company which will supply profitable, positive, audio and visual entertainment to a diverse, international consumer group. REC is committed to wholesome entertainment across the board and firmly believes that quality, palatable entertainment can be realized without compromising commercial appeal. REC distinguishes itself through the commitment it undertakes with each of its artists. Contrasting the typical scenario in which a record company spends more money producing the music than they do in its marketing and promotion, REC will utilize a stable of experienced and resourceful producers to ensure the highest quality product within established production budgets. This, in conjunction with the financing and expertise necessary to stage intense, relentless marketing campaigns will guarantee the impetus necessary to create "winning" products in the marketplace. REC is composed of three internal divisions: Reed Music, Reed Video, and Reed Ancillary. The company will compete and earn revenue immediately through the creation of several lucrative profit centers, beginning with pre-recorded music [compact discs (CDs), enhanced CDs (sound & picture combination), CD Rom, cassette tapes and vinyl albums.] Additional income will be produced from distribution, video, merchandising and concert promotion. Each of the albums that REC produces and owns will create valuable short-term streams of revenue. Owning and controlling the rights to each of its albums will enable REC to grow its music catalog into a valuable asset, one of several-hundred revenue producing titles. The talented group of individuals who have united to form this innovative company, combined with industry affiliations and a highly esteemed Board of Directors, will catapult REC into the future as one of the industry's leading entertainment companies. REC's co-founders are Mr. Samson Rama, Mr. Carl Lever and Mr. Nathan Reuben. As a renowned producer, recording artist and employee with such major companies and labels as Rexmark, Connor, Regal, Emblem and Coastal Records, REC's Chairman, Mr. Rama, has directly produced and contributed to over $100 million of revenue for major record companies throughout his career. Moreover, Mr. Rama has linked and placed projects and music titles with the following television networks and television and motion picture production companies: JBN, TXK, CSC, Global Television, Heavenly Pictures and Bloomfield Entertainment. Mr. Carl Lever, a graduate from the Johnson Center, in the College of Business at the University of Nevada, possesses a wealth of entertainment and general business experience. Mr. Lever provides the essential business acumen to direct REC in daily finance, accounting and resource management functions. In addition, a qualified, experienced and talented management team has been selected to operate Reed Music and its associated labels. Learning and achieving success in all facets of record company operations, the members of the management team have honed their skills in the areas of project production, artist & repertoire, marketing and artist promotion. In fact, these individuals have produced and marketed artists such as Paul Firemen, The Collins, Sam Schnegle, Black Patton, Glory, Shayna and Angie Lanzi. Several of these projects have earned nominations for Grammy and Stellar Awards. This assemblage is poised to utilize its combined skills to ensure the growth and profitability of REC. Reed Music is REC's primary thrust for the first several years of operations. Responsible for the cultivation of talent, the production of pre-recorded music product and its marketing, the success of REC Music will lay the groundwork for additional REC profit centers. REC Music and its associated labels strive to fully maximize the success and profit potential of each artist. Four record labels comprise the company's music division. Each division has been created with a distinct and specialized reputation of its own, and will be responsible for a separate genre of music. Ocean Records produces and promotes mainstream Pop, Dance, Alternative Rock and R&B. As the widest music market, REC Music personnel have auditioned and selected several artists who will debut with Ocean Records. Wave Records is responsible for Jazz and new Adult Contemporary products. The growing popularity and profitability of these music genres dictates quality product supported by solid promotional and marketing strategies and budgets. Stone Jackson, Herman Flax, and Manley Cont will be among the first projects released by Wave. This veteran roster provides Wave with artists possessing a recent track record and an existing loyal customer base. Combined, these artists have sold over 750,000 units in the past three years. Beat Records will create and produce Urban, Rap and Hip Hop genres. Beat is intent on producing music with clean, positive lyrics. Electronic production capabilities lower production costs enabling projects to be completed at one-third the cost of projects in the other music genres. 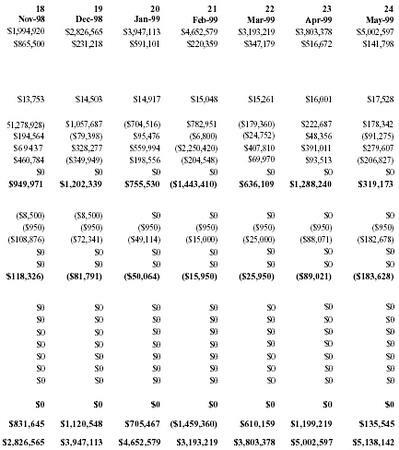 This allows REC to recoup its investment and realize profits with a lower break-even point. Light Records is designed and created to produce and promote inspirational and gospel recordings. Light Records is committed to the work of the ministry, and will acquire artists who share in this commitment. Mr. Jack Corbin is at the helm of this record label, and brings affiliations and an established network in the Christian music realm. Growing in popularity and strength over past years, Christian music has become a profitable and effective launching ground for new artists. Reed Music and its associated labels will produce and release four projects from each label in each of the first two years of operations. A second phase consisting of sixteen productions for artist follow-up albums and newly acquired artists will begin in late 1998. During the course of 1997-1998, Reed Music's Artist and Repertoire Department will locate, assess and consider additional recording artists. Reed Music has begun discussions with a variety of known recording artists who are interested in signing with Reed Music. The majority of the Reed projects will be produced at Brandy Recorders, in Las Vegas. A multi-million dollar facility, the quality of Brandy's equipment, the architecture of the studio and its atmosphere are conducive to creating the highest quality projects in a cost and time effective manner. By pre-purchasing large blocks of studio time, REC will have access to the two studios in this facility at a heavy discount. Artists such as Jasmine Hail, Bronx Duo, Calvin Griffith and Smash have recorded at this facility in recent years. REC will utilize a variety of independent record producers for the studio production of its projects. Producers will be hired on a per project basis. These producers will be paid up-front fees and will also receive royalties (3%) from unit sales. Networks of producers are available to REC for the specific genre of music. Additionally, each of REC's Vice Presidents have a production background which will ensure the delivery of quality product on budget. A plethora of options are available to satisfy REC's requirement for quality manufacturing and reproduction of compact disc, cassettes and videos. REC will outsource this function to one of many manufacturing outfits in the industry. These vendors will be selected based upon quality of product, ability to meet delivery deadlines, payment terms, inventory and storage options, as well as price. Several manufacturers that REC is currently considering are: Holly Manufacturers, Inc., Farwell Manufacturing, and JXT Manufacturing. REC has been offered international distribution of its product through Rexmark Ultimate and the Johnson Group. A working relationship with either of these companies will allow REC to readily expose each of its music products to the world's largest music markets, while generating $8.50 -$9.50 per unit sold. Chief among REC's goals is to design and provide creative and effective marketing for its artists. As music is being produced in studio, promotion and marketing strategies will be formulated. It is crucial that the marketing plan for each new release is in motion several weeks before the product is completed in studio. REC will employ multifaceted promotional strategies for its product releases including: hiring regional independent record promoters and creating radio promotions, Internet sites, broadcast videos, dance club promotions, in-store/co-op promotions and promotions to the general public through print, video and television mediums. To support the sales of pre-recorded music, Reed Video will produce and release music videos for each album released by the company. Existing affiliations in the video sector of the industry allow the company to produce top quality video productions while minimizing budgets. At this stage, music videos will be created for 3-4 songs on the album which will be released as "singles", as a prelude to the full album release. Reed Music will contract with independent record promoters to interface with radio station program directors and music video network directors. Public relations firms will be hired to publicize and promote REC recording artists. Reed Video & Television is established initially to support pre-recorded music products through the production of broadcast music videos. Understanding and capitalizing on the close relationship between audio and video entertainment will quickly propel REC's products in the marketplace. Rivaling radio in terms of the most powerful promotional tool for pre-recorded music sales, broadcast music videos are a crucial instrument to ensuring successful product launches. Reed will produce two to three music videos for each new project completed by the company. Videos will be created to appeal to the target audience of the particular song. REC has created relationships with several firms for the production of music videos. Specifically, PSB Productions and Lighthouse are two full service production companies that have submitted demo reels and music video concepts to Reed. 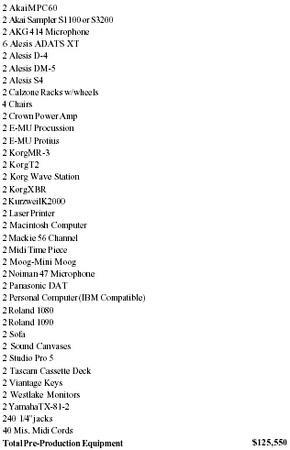 Having pledged support of Reed's mission, these companies have offered below market fees and full use of their audio and video equipment. Broadcast music videos will be distributed to such networks as Telereed, Bono, Abcorp., etc. Independent record and video promoters will be hired to gain maximum air time and exposure for company videos and artists. Furthermore, these promoters will work to gain exposure for videos in non-traditional music settings such as: bank lobbies, department stores, airplanes, stadiums, retail establishments and other public settings. The third division of the company, Reed Ancillary will be responsible for additional business opportunities related to the sale of pre-recorded music. Initially, distribution, merchandising and concert promotion will be developed. As the company grows and matures, diversification into other revenue generating opportunities will occur through Reed Ancillary. Reed Music will utilize its distribution network to allow for the distribution of projects for smaller, independent record labels. A key factor affording REC the opportunity to capitalize on this, is the company's close, personal relationships with both Rexmark Ultimate and the Johnson Group. REC's ability to claim top dollar from these international distribution companies will enable it to earn a middleman fee on the distribution and manufacturing of other companies' products. Reed will earn between $2.50 and $3.00 for each unit manufactured and distributed. Company founders have had discussions with numerous record labels across the country who are interested in working with REC. Partnerships with these companies will be dictated by the strength of company management, the quality of both their artist and product and the size of their marketing and promotion budget. The independent distribution division of the company will be incrementally increased over a three-year period with four independent projects being distributed in 1998, six projects in 1999 and twelve projects in 2000. A lucrative profit center for Reed, merchandising opportunities will be created upon and around company artists and products in concert venues and retail outlets, alike. Concert merchandise (t-shirts, sweatshirts, hats, programs, posters, buttons, etc.) is typically sublicensed to a merchandising company specializing in retail operations at large concert venues. REC has several relationships with merchandise managers involved with many national sports franchises and arenas around the country. Retail merchandising strategies will be coordinated and planned with the assistance of advertising agencies and public relations firms. The chief objective will be to create alliances with apparel manufacturers for Reed artists, similar to the manner in which athletic shoe manufacturers attach an athlete's name or image to a particular shoe. Of course, these opportunities will become more readily available as the artist's reputation increases. Nonetheless, REC will work to make inroads in this realm early on. The company is preparing to design and release a line of Reed casual wear, including such items as shirts, hats and jackets. Distribution of these products to music related retail outlets will occur through REC's pre-recorded music partner. Distribution to mainstream apparel outlets will also be secured. As a related means to increase exposure for the company artists, Reed will plan and promote several live concert shows a month. Shows will be staged at a variety of major concert venues throughout Nevada. Revenues will be generated from the sale of tickets, concessions and merchandise. Early on, the company will plan and promote two shows per month. This will allow REC the opportunity to attract outside talent to perform in the Las Vegas metropolitan area. It is anticipated that as this division of the company grows, regional promotion contacts will be established allowing for expansion and increased revenues. It has become common practice to classify all but the major labels (those having their own distribution systems) as independent labels. Independent labels have been described by knowledgeable music industry professionals as "the lifeblood of the business." In fact, in 1995 independents accounted for over 19.2% of the music industry's market share. Lacking large budgets for project production and marketing, independent record companies have had to be more resourceful over the years. Such facets of the business as, intense talent scouting (Artist & Repertoire) and grass roots marketing campaigns have been utilized to compete with major record companies. Furthermore, independents cannot rely on the occasional "big hit" record, but rather have established and grown music catalogs to provide streams of revenue. In growing a music catalog it is imperative to compile a reliable group of artists, who are dedicated to producing quality music. This enables the company to steadily increase the number of unit sales for a particular artist over a two to three album process. Major recording companies frequently invest in independent labels when confidence in the company's roster and management exists. In these strategic alliances and joint ventures, the larger company may invest money to: a) assist in completing album projects, b) manufacture compact discs and tapes and c) assist with marketing and promotion plans. Although independent distribution channels (Johnson, Wallace and Cordoba) exist, many independent labels choose to utilize the independent distribution services offered by major labels. This is an attractive choice for independents, due to the breadth and reach of the distribution in addition to the clout which the majors possess with retailers. In these situations, independents can "piggy back" on the reputation of the major. Several UK companies that started as independent firms and joined forces with a major include Clover, Maid and Roots. Similar success stories are documented with U.S. based companies such as: Appleton, Chatham and Mill Point. From the outset, these companies demonstrated creative leadership, quality product and determination. Industry Sales Volume in the U.S. The U.S. record business, which grossed two billion dollars in 1970, exploded to four billion dollars in sales by the end of 1978, with a unit volume of 726 million records and cassettes sold. Sales fell sharply over the course of the next six years, mainly due to the declining American economy and the popularity of home cassette taping. It wasn't until 1988, when unit volumes reached 726 million, that the industry exceeded the pinnacle reached ten years ago. Recent calculations of industry figures indicate more than 10 billion dollars in sales and a volume of more than 955 million units. Reed has formulated a simple but successful approach to market its products. The chief marketing objective for REC's pre-recorded music, video and programming products centers around the design and implementation of a strategy that will cost-effectively deliver that product to the intended target market. Ensure that each project achieves and sustains a "Top Ten" position on industry music charts. Hire independent record promoters in each of four separate regions of the U.S. Considering the onslaught of product released to the music/video market each month (1,200 new releases) worldwide, it is crucial to ensure the visibility of each project. The financial success of an album can be guaranteed through the establishment of proper marketing and promotion budgets. However, without the dollars necessary "to win" success is a "crap shoot." With properly established budgets, Reed Music will generate large streams of profits from each of its projects. The marketing and promotion budget will be divided into twelve to fifteen-month campaigns, each consisting of three phases. Phase 1 begins with the creation of music videos for approximately three songs from the new album project. Once these have been shot and edited, the first "single" and its video counterpart will be released to the public. At this point independent promoters will canvas radio stations, video networks and dance clubs (depending on the genre of the release) to ensure proper air play for the first single. Within the next six weeks, a second "single" release will be promoted to the public. This strategy will enable Reed to achieve two important outcomes-increasing the number of "singles" that are sold in retail outlets, and building anticipation for the release of the full-length CD/cassette. Phase 2 concentrates on the publicist, print advertisements and media exposure. Riding the momentum of the "single" releases, the market will be printed to hear and learn more about the artist(s) through articles in both trade and non-trade magazines, as well as radio, television and Internet interviews. Furthermore, the publicist will also be able to create valuable exposure for the charity/non-profit organization that the artist has chosen to assist and promote. Phase 3 begins with the release of the full-length CD/cassette. This will be accompanied by intense in-store and retailer co-op advertising. Retailer programs will be designed to acquire valuable listening posts, end-cap displays, window/wall posters, point of sale advertisements and co-op advertising in mailers and store circulars. Additionally, the third and fourth "singles" will be released during this phase. The systematic release of "singles" will sustain the artists popularity while increasing and prolonging sales of the full-length album. Furthermore, during Phase 3, the artists will make promotional appearances at clubs, retailers, radio stations and charity events in conjunction with scheduled concerts. Despite the fact that radio no longer possesses the sole influence on record sales, sharing the spotlight now with video resources, it is still a heavyweight medium for record promotion. With so many changes occurring in the radio/video industries - the sale of radio stations for tens of millions of dollars, for instance, along with the fragmentation of radio formats and escalating success of video, promoters have been forced to realize that they are in a business and must therefore approach their jobs in a far more business-like manner than is traditional. Promoters are now more concerned about the facts and figures rather than simply trying to impress program directors with the great new song they have to offer. Major record labels utilize both in-house and independent promoters to assist in the effort to maximize the airplay of a new song or album. An in-house radio promotion staff makes financial sense assuming the company maintains a steady and consistent release schedule to a specific genre or radio format. Personal relationships with radio station format directors is the name of the game in this arena. Bombarded by new song and album releases each month, program directors are inclined to assist those with who they are familiar and friendly. Reed Music will utilize the services of outside radio promoters. Known as independents, these promoters have established networks and relationships with radio station program directors. Most independents position themselves and focus within a specific music genre. Reed Music has created a network of independents who will be hired to interface with radio stations. Specifically, Reed Music will create and design goal oriented and incentive based contracts with independent promoters. Measurable criteria will include some of the following: peak chart position obtained, number of weeks on the charts on which a specified position was obtained. Reed Music's independent promoters will focus their efforts and attention on reporting stations. A reporting station is one that trade papers/magazines and tip sheet publishers telephone each week to learn which recordings were and are planned to be programmed. This information is gathered and tabulated from all around the world. It is presented to the public in the form of a chart which shows such information as current chart position, previous chart position, artist, record label, etc. The promotion of pre-recorded music is inextricably bound to TV related transmissions of music, including conventional TV, cable, pay-cable and direct satellites. Sales are increased immediately when music is linked to visual entertainment, whether the medium is a movie musical, a TV broadcast or a music video. Broadcasts and cable companies now transmit dozens of video shows, and their impact on record sales is clear; videos not only increase record sales, they break new acts, and prolong the chart life of new recordings. In addition to canvassing radio stations, independent record promoters will also devote substantial time securing airplay for music videos. Boundary TV and similar outlets guarantee huge national exposure, just as with radio. Reed Music will place heavy importance on music videos, considering the national and international reach of these networks. Music videos will offer exposure to those markets presently unexploited. The genre of music dictates the approximate marketing and promotional budget amount. For instance, due to the breadth of the mainstream market, a project released through Ocean will require twice the amount of a Wave project. In addition to the long-term benefit of creating a loyal customer base, REC will utilize these opportunities to immediately sell copies of the artist's project, as compact discs and cassettes will be available at merchandise tables at concerts and appearances. Dance clubs are effective mediums to test market new recordings. Prior to the commercial release of mainstream singles, the songs will be distributed to clubs to test public response. Reed will work closely with its independent promoters to establish networks of clubs throughout the country which will be utilized to test new releases. Results from these activities will provide crucial information in a timely fashion, allowing the company to tweek (re-mix) a recording if necessary. Furthermore, Reed Music expects to increase sales by promoting music videos of new releases to be played in the clubs. Dancers who become surrounded by the club's multiple screens and overpowering sound systems may be stimulated to later walk into a store and purchase a copy of the product (audio or video) to continue enjoying the music at home. A key piece in the promotion of new product releases is the "creation of mass interest" in the marketplace. This is done in the motion picture industry with sneak previews, interviews with starring actors/actresses and directors, television commercials and print advertisements. The coordination of these activities is the responsibility of the publicist(s). REC will utilize publicists to create the buzz in the marketplace about new projects and artists. Initially, this important function will be outsourced to credible public relations firms, until such time that it is feasible to internalize this position at Reed. Publicists will arrange and promote appearances and interviews (talk shows, industry publications, mainstream magazines) and create written materials and ad copy about the artist to catch public attention. Combined with concentrated airplay and print advertisements, the impact created from the publicist's strategy creates the most powerful advertisement, word of mouth. Music buyers who hear the "talk" and hear the music on the radio are more inclined to enter a music store to make a purchase. Advertising campaigns will concentrate on the types of exposure that fashion designers have mastered in the realm of advertising. A variety of media will be used including print, broadcast, point-of-sale and direct mail. With a mass consumer product such as music, it is feasible to reach specified target segments by placing advertisements in mass print media-magazines and newspapers. Some advertising will be cooperative with the store and Reed sharing costs. For example, a print page or media buy that promotes a REC product in conjunction with the retailer. Co-op advertising may be paid all or in part by the retailer, who is reimbursed by Reed from a co-op budget determined by the retailer's volume of purchases from the label. To justify the high expense, several Reed Music releases will be pushed in one ad, thus pulling down the "cost-per-thousand" expense per release. From time to time, record stores may request that Reed finance a print media campaign in their area. Reed will initiate print ads when trying to coordinate advertising with the promotion of concert appearances by a Reed artist. As a pillar of the company, community outreach will play an integral role in both the company and artist positioning. To this end each Reed artist will be aligned with a specific charity or community organization. Supporting the company's philanthropic desires, artist participation will enhance public image while generating exposure and revenue for chosen charities. More specifically, a page inside each compact disc will be devoted to a charity or non-profit organization. Additionally, space on each artist's World Wide Web page will be reserved for a non-profit organization. Furthermore, Reed Entertainment will lend additional support to these charities through corporate fundraising opportunities and donations from company revenues. Also a crucial function, proper art direction can greatly enhance the image of a product, lending added power to the promotion and marketing strategies. Responsible for artistic layouts, print advertisements, compact disc design, j-card design, merchandise design and the creation and maintenance of the corporate identity; the creativity displayed by this department plays a key role in positioning and packaging the project to the consumer. Within the first few months of operations, this function will be overseen internally, with many of the specific projects being completed by independent graphic artists. This will minimize REC overhead expenses while maintaining the highest level of creativity. Traditional distribution channels into music related retail establishments enable REC the opportunity to reach retail outlets throughout the world. REC will closely coordinate product launches and utilize the distributor's clout with retailers to design specific strategies for enhancing advertising and marketing presence within retail establishments. These strategies will focus on point-of-sale advertisements, in-store advertising opportunities, print, radio and television co-op opportunities. One such strategy to be implemented once the company has several artists on the market, will be presenting retailers with the opportunity to place an attractive Reed aisle end-cap display in the establishment. The display is intended to promote four to five REC artists' compact discs simultaneously. REC will also design other in-store advertisements such as counter-top point-of-sale advertisements, window posters and banners. In addition to listening posts (product displays which allow a potential buyer the opportunity to sample the product prior to purchase), REC artists and products will also be advertised in retailer newsletters and bulk promotional mailings to the public. Additionally, REC is examining the prospect of distributing products through network marketing channels. The recent explosion of network marketing concepts has produced millions of distributors and consumers worldwide, providing an effective means to reach the public. The distribution breadth of individual companies will be evaluated to determine if access can be gained to selected target markets. Furthermore, REC will distribute its products through the Christian Music Association. An established national network, this channel provides an excellent vehicle for the distribution of Gospel and Inspirational products. Reed will submit songs to motion picture studios as an additional means to provide promotional support for company projects. The promotional mileage created from being included on a soundtrack for a major motion picture is enough to assist in moving several hundred-thousand copies of the album. In response to the growing popularity and necessity for a presence on the Internet, REC will create and design a web presence for itself. Utilizing the latest web site technology, REC's web site will be intended to advertise the company, announce and advertise new releases, sell company products and merchandise and offer e-mail communication. Furthermore, utilizing the latest technology, visitors to the web site will be able to sample music clips from REC's artists. Management has secured a domain name for the site. Furthermore, REC will create space on its web site for each artist signed to the company. Allowing for increased public exposure, the public will be able to learn more about the artist or group. Additionally, space will be provided to promote chosen non-profit organizations and charities through this electronic medium. REC's independent promoters will mail promotional copies of the product to a large number of radio, cable and TV outlets. Independent promoters have the experience and the established networks to use select mailing lists, ones that include mostly influential stations or stations where the promoters possess person contacts. Mail campaigns will be followed by telephone calls. The success of this kind of telephone follow-up will be based upon the suitability of the recordings mailed, and the already established rapport between our promoters and the radio/TV programmers. The promotion and marketing facets of the record business are vital to REC's overall success. A quality product is only the first step in the equation for hit records, videos and programming. Reed will ensure its financial success through consistent and balanced marketing strategies designed to reach desired target markets. The strength of REC's management team is derived from the blend of experience, creativity, savvy and energy. The following individuals who occupy key positions within REC are dedicated and prepared to ensure REC's success and profitability. Mr. Rama, a co-founder and the Chairman of the Board, provides the vision for REC's future. A renowned producer, and recording artist, and employee with such major companies and labels as Rexmark Ultimate, Connor, Emblem and Regal, Mr. Rama has directly produced and contributed to over $100 million of revenue for major record companies throughout his career. Beyond the creative side of the business, Mr. Rama has developed the business and interpersonal skills necessary to lead REC. He maintains close personal relationships with many executives and personnel within the music industry. These affiliations and contacts will provide REC with the proper positioning to navigate within the industry. Having earned a Doctorate in Social Education in 1983, Mr. Rama has placed great emphasis on teaching and mentoring youth. His work as Executive Director of the Henderson Youth Program and his past position as Head Coach for the Collingwell High School Basketball Team have given Mr. Rama the forum to positively impact youth. Mr. Carl Lever will operate as REC's COO/CFO. Mr. Lever, a graduate of the Johnson Center, in the Business School at the University of Nevada, provides REC with a wealth of tangible business experience. Throughout the past several years, Mr. Lever has honed his general business skills as a business consultant. He has worked with over 100 businesses in Arizona, assisting with accounting and financial analysis as well as the creation of marketing and business plans. Furthermore, as a representative of the Applewood Corporation, Mr. Lever participated in a series of business/marketing seminars in Russia. Working closely with the management of several Russian service and manufacturing companies, Mr. Lever assisted in creating marketing plans for companies which previously operated under the Communist regime. Furthermore, Mr. Lever has honed and developed many of his business skills as the General Manager for a multi-location dry-cleaning franchise. Specifically, his duties included company-wide operations management, financial services and franchise development. A finalist in the annual Business Plans Competition at the University of Nevada in 1991, Mr. Lever was also invited to participate in the Moot Corp Competition. In fact, Mr. Lever was the first undergraduate student to be chosen to participate in this worldwide competition. Mr. Clayton Gorman provides an impressive blend of entertainment and general business which will be instrumental in leading Ocean. Most recently, Mr. Gorman served as the Executive Vice President for Emblem, in Nashville. In this capacity, Mr. Gorman was responsible for artist development, artist negotiation and music production. Currently, Clayton Gorman is the Director of Gospel Music, for T-Dog Music, also located in Nashville. Throughout his career, Mr. Gorman has worked extensively in the music industry. In fact, his work has produced Grammy Nominations, as well as RIAA Certified Gold Albums. Specifically, he has worked with Carville Records. Mr. Gorman has also devoted several years of his professional life to community and youth organizations. As a founding member of the Child Benefit Group in Nashville, Mr. Gorman has assisted youth of all ages. Each of these programs currently serves over 1,200 youth, providing guidance and education in the areas of life skills, reading, math and general counseling. As a result of his dedication and commitment in this area, Mr. Gorman was nominated and received the prestigious Community Excellence Award. A graduate of Harvard University, Mr. Todd Richard has developed a multi-faceted background with experience in finance and banking, in addition to comprehensive experience in the entertainment industry. As an employee with New Sound Productions (New York), Mr. Richard received his first "taste" of the industry. While with this company, he had the opportunity to work with many Gospel legends. Mr. Richard honed and developed his management and production skills. It was with this experience that Todd founded the Salt Group, a company which produces audio and theatrical productions. The company also manages artistic clientele in the genre of Christian music. Working in the realm of Christian music, Todd has developed a cadre of affiliations. Relationships with artists, concert promoters, program directors (radio stations) and ministries across the United States will be beneficial to his role as the Senior Vice President of Light Records. A graduate of Savannah College of Music (SCOM), in 1975, Mr. Cont has developed a varied background of experience in the industry. Most recently, he has concentrated on his solo career which has produced four Jazz albums for Emblem. His album projects have collectively sold over 375,000 units within the past five years. After graduation from SCOM, Manley honed his musical skills while touring worldwide and recording with various Jazz groups. In addition to his own projects, Manley has participated in the recording of over fifty albums. Furthermore, Mr. Cont has taught several high school music classes utilizing his proficiency with woodwind instruments to promote music to youth. Due to his experience in the Jazz niche of the music market, Manley has developed a solid network of personal contacts with radio promoters, musicians, producers, and executives. These affiliations are invaluable to REC and will allow the company to make an instant impact in the marketplace. The following is a description of the key roles and responsibilities attached to the daily operations of Reed Music. Each of the label Vice Presidents will be directly responsible for all of the functions within their particular label. Label Vice Presidents will solely handle the majority of these functions for their particular label with the assistance of shared administrative staff. As each label grows in terms of sales revenue and the number of recording artists, additional staff will be added to provide necessary support. Wherever possible and feasible, staff will be shared between labels in an effort to minimize unnecessary overhead. Responsible for selling the company's product to wholesalers and retailers. It develops sales campaigns, determines policies for discounts, special deals and returns, takes orders for product and oversees sales activities on local levels, provides financial assistance to accounts for advertising and oversees billing. The sales department consists of members of a national sales team - senior executives, salespersons and other employees of the branch distribution system. This work is done in-house by small labels or contracts with regional concerns to handle these functions in different parts of the country. This department may also be referred to as "Artist Development". Found in most medium to large record companies, product managers coordinate and oversee all aspects of a current release, including packaging, advertising, tours, publicity, promotion and sales activities. This entails close liaison with personnel from other departments within the label. The object of this department is to oversee the overall career growth of signed artists, giving whatever input necessary for the artist to achieve and/or sustain commercial success. The function of the publicity department is to bring press and other media attention to the artist which will, either directly or indirectly, aid in the sale of records. Inherent in this goal is the continued visibility of the artist in newspapers, magazines, trade publications, on radio and television programs and special industry award shows. Reed labels will employ an outside promotional staff to seek the greatest possible exposure for artists and products through radio and video air play. Representatives deliver new products to radio stations and closely monitor their play lists to see if their song is being played. The same approach is taken with regard to video outlets. A large part of the success of a record is predicated upon the amount of radio air play it receives. The competition is fierce. As such, a record should not be randomly promoted to radio stations. This department has broad responsibilities, which include talent search, contract negotiation, interim artist management and development (unless the artist has other management), tour support and publicity. A general breakdown of Artist & Repertoire (A&R) responsibilities include scouting for talent, locating songs, pre-production functions such as providing creative input, scouting producers, planning budgets, etc. ; production functions such as reviewing tracks, determining album sequencing of tracks, recommending singles, monitor mastering and manufacturing, creating excitement within the label itself, etc. This department handles the clerical aspects related to A&R and supervises various administrative activities. These responsibilities include planning and monitoring budgets, examining studio bills, preparing studio reports, ordering references and parts, collecting information for label copy and packaging, monitoring and reporting on contractual options, copyrighting works for a single or album and obtaining mechanical licenses. This department is primarily responsible for creating and supervising marketing campaigns, including developing marketing concepts, creating and executing graphic art, creating editorial copy and designing "point-of-sales" stimuli posters, banners and window displays, etc. Reed has developed a sound, conservative financial plan which provides the founders, investors and employees the opportunity to financially capitalize. The following paragraphs provide valuable details and insight to the figures which comprise the plan. 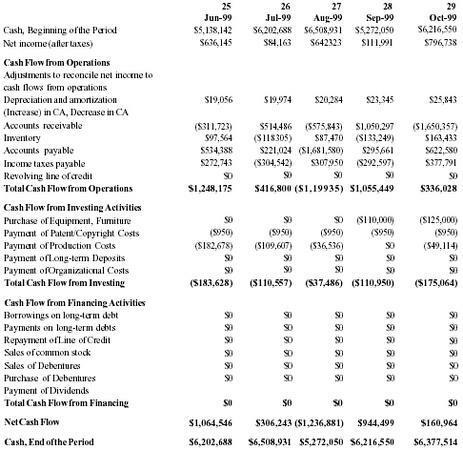 Achieve overall positive cash flow within the 1st quarter of 1999. Maintain a net profit percentage of 25% beginning in 1998. Position the company to allow investment partners, founders and employees the opportunity to financially capitalize on Reed's profitability. 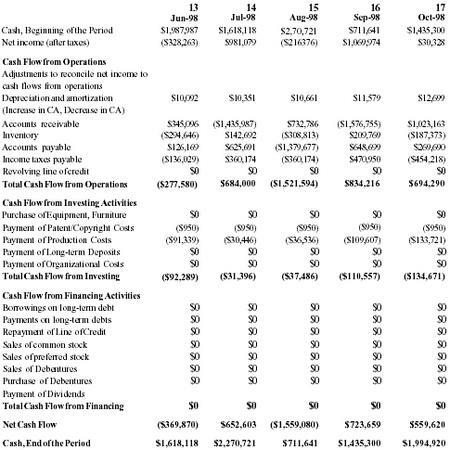 The financial rationale accurately describe the various assumptions which comprise the pro forma income statements, statements of cash flow and balance sheet. In all cases, these assumptions follow a conservative approach. Reed will generate the majority of its revenue from the sale of pre-recorded music product. This includes compact discs (CDS), cassettes, CD singles, cassette singles, vinyl albums and enhanced CDS. For purposes of revenue forecasts, management has projected varying unit volumes for each of its projects. Sales will occur within a fifteen-month time frame from the release date. Based upon the intensity of Reed's marketing plan/budget for its projects, the following unit projections will be quickly attained and surpassed. Reed will gross approximately $8.75 for each full-length compact disc sold, and approximately $6.00 for each full-length cassette. The current retail price for compact discs and cassettes averages approximately $14.72 and $9.15. Currently, the industry is reporting four CDS sold to each cassette. In addition to the sales revenue generated from the full-length CDS and cassettes, revenue will be earned from the sales of "singles". The retail sales price for "singles" is $6.50, resulting in a gross revenue of $5.00 per CD unit for Reed. Reed will release three to four singles from each full-length album project. 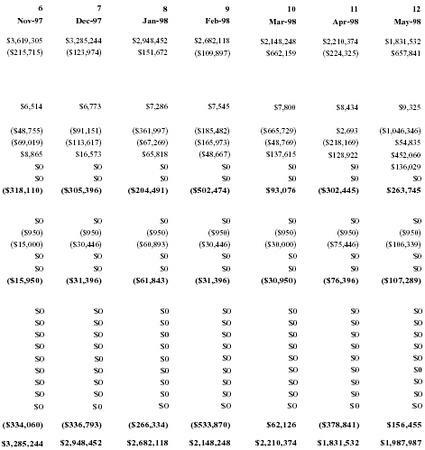 Revenue projections in the financial model are based upon the following estimates of "single" sales. Additional Reed profit centers will include distribution, video revenue, merchandise revenue and concert promotion revenue. 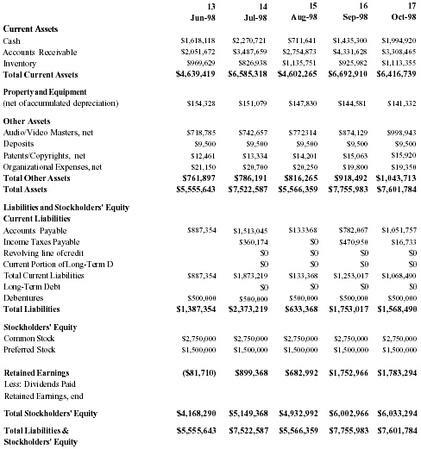 Initially representing less than 5% of the company's revenues, the magnitude and scope of these areas will increase as Reed and its artists' reputations increase. Cost of Goods Sold is comprised of: artist/producer royalties, mechanical royalties and product manufacturing (CDS, cassettes). Artist/Producer Royalties will be paid from the gross revenue figure of $7.90 for CDS and $6.00 for cassettes. On average, the artist and producer royalty percentage are 8% and 3% respectively. Royalties attributed to "singles" will vary depending on the volume of "singles" shipped. Recording artists and producers will accumulate and earn royalties for each unit sold after the project's break even point has been reached. Manufacturing of CDS and cassettes will be subcontracted. Applying discounts available with large quantity purchases, Reed will obtain a price of $1.10 per CD and $.90 per cassette. As unit totals increase, manufacturing costs are expected to drop 10-15%. It is management's intention to minimize G&A expenses in an effort to keep overhead expenses manageable. A full list of applicable expense items including associated monthly amounts is available upon request. 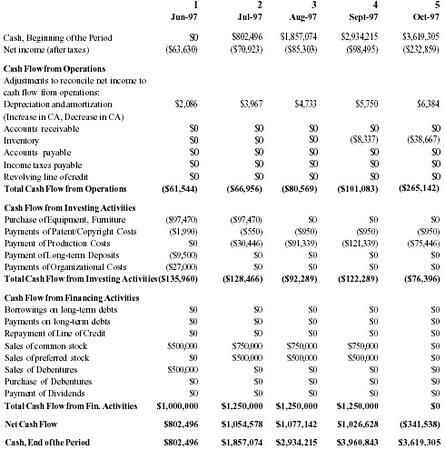 Accounts Receivable - A/R are conservatively projected with 45% of A/R collections occurring in a 1-29 day period and the remaining 55% in a 90-120 day period. The majority of accounts receivable will be outstanding from the distribution company, which receives payment directly from retailers and will subsequently remunerate Reed. Because of the extended nature of A/R in the industry (typically 60 days), Reed will utilize A/R Financing to assist its cash position in the first twenty-seven months of operations. A 3.5% A/R financing fee is incorporated in the financial model. The size, strength and reliability of Reed distribution partners will provide a traditional financial institution or an A/R Factor with the proper security to create a working relationship for Reed's paper. Inventory - Inventory for album releases and upcoming product has been conservatively projected. Despite the fact that lead times for manufactured products are approximately two weeks, Reed's financial model calculates inventory purchases in the following manner: 30%-60 days prior to sale and 70% - 30 days prior to sale. The majority of the pre-recorded music product will be stored with the manufacturer and shipped directly to the distributor's fulfillment/distribution centers. A small amount of sample (1,000-2,000 units) and promotional products will be kept on hand at Reed corporate offices. Accounts Payable - For purposes of this financial model, A/P is separated into two categories: Manufacturing A/P, and Artist Royalty/Mechanical A/P. Adhering to the conservative approach, the model is constructed with Manufacturing A/P being paid in the same month that the expense is incurred. Artist Royalties will be accumulated and paid bi-annually, in August and February. Project Production Budgets - These vary depending on the genre of the project. Established relationships and affiliations in the industry enable Reed to produce its projects over a ninety-day period, for approximately half the typical cost paid by a major label record company. Projects produced through Ocean and Wave require $121,000, Light Recording's projects (Inspirational/Gospel) require $80,000 and Beat projects (Rap/Hip Hop) require $45,000. Marketing & Promotion Budgets - These vary depending on the particular genre of music. Projects produced and released from Ocean will be allocated approximately $781,000 while $390,000 will be slotted for Beat projects. Projects from both Wave and Light will utilize approximately $240,000. Marketing budgets will be expired through the course of twelve-month marketing campaigns. 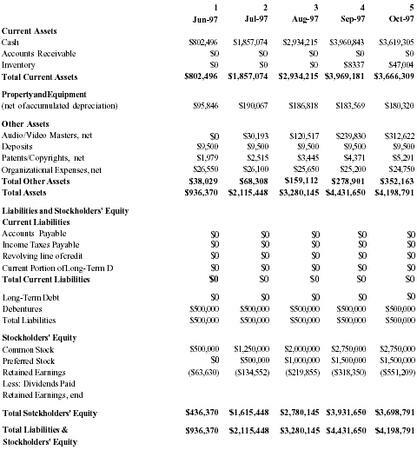 The following assumptions are made in the projected Balance Sheets. Cash - The financial model is designed to portray the accumulation of cash in the company. Cash outlays relating to dividends on common/preferred stock, employee profit sharing, and capital expenses, etc., have been intentionally not included. Moreover, the plan does not address the tax implications of "holding" this amount of accumulated earnings. Property & Equipment - Property and equipment acquisitions include initial office equipment, pre-production studio equipment and leasehold improvements (office/studio). 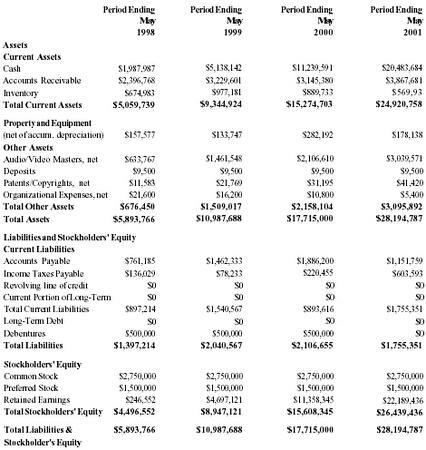 For purposes of the financial plan, these assets depreciated over sixty months. 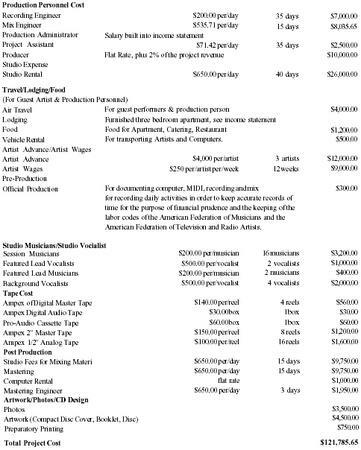 Audio/Video Masters - Combined production expenses for all radio and video projects. 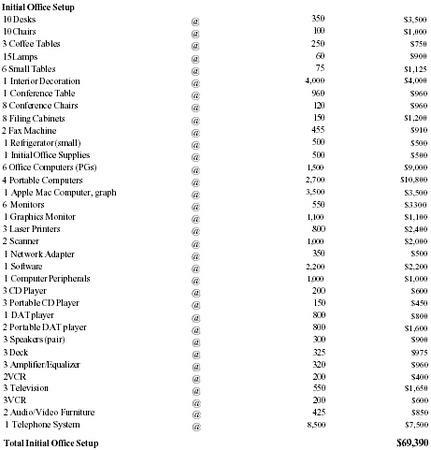 These items are depreciated over the course of 120 months. Deposits - This line of the balance sheet relates to utilities deposits required for corporate offices. Copyrights & Trademarks - Included are the filing and legal fees associated with copyrights and trademarks for each of Reed's projects. These items are amortized over a 180-month period. Organizational Expenses - Legal, accounting and other professional fees necessary in organizational process. Amortized over 60 months. Reed is offering several simultaneous investment opportunities to cater to short and long-term investor needs and requirements. Reed seeks to keep the structure of the financing simple and flexible. Reed is incorporated with 10,000,000 shares of stock. The Board of Directors has authorized the issue of 4,000,000 shares of common stock, in addition to debentures for the first and second phases of the offering. Phase 1 of the offering is composed of 500,000 shares of common stock and 500,000 debentures (12.5%). Phase 1 is a linked offering meaning that for each share of $1.00 common stock purchased, a $1.00 debenture must also be purchased. Reed possesses the right to re-purchase the debentures at $1.00 within a five-year period from allotment. Reed founders, Samson Rama, Nathan Reuben and Carl Lever will collectively own 500,000 shares of common stock. Once Phase 1 has been fully subscribed, Reed will issue 1,500,000 shares of common stock at $1.50. Additionally, 1,000,000 shares of $1.50 preferred stock will be available. The preferred shares will carry 13% dividend to be paid annually. The shares in the second phase will also be linked offering: two common shares linked together with one preferred share. Reed will hold the right to redeem the preferred shares from holders at $2.50. This action can take place within eight years from issuance. The founders will be issued warrants for: a) options for two million shares of common stock at $2.00/share within five years, b) an additional option for one million common shares will also be available at $5.00/share within eight years. The following budget addresses all relevant costs involved with producing an album project. The entire process, pre-production through final mixing/mastering encompasses approximately 90 days. 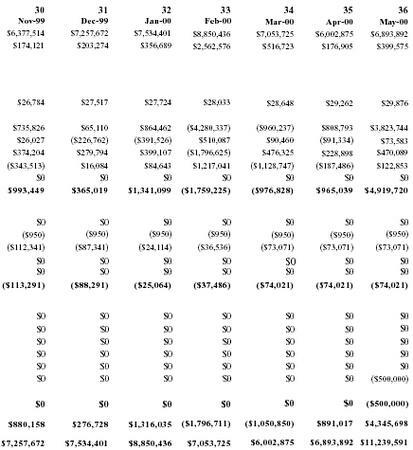 The following budget is written for a typical project for an R&B, Pop, or Jazz Album. Projects released through Light Recordings (Gospel) and Beat (Urban, Rap) are 66% and 40% of this total. 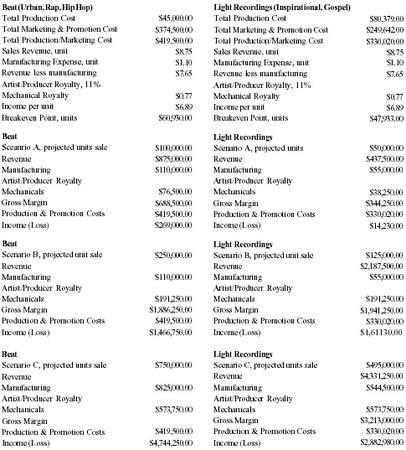 The following calculations determine the breakeven point in units given the projected production, and marketing expenses. 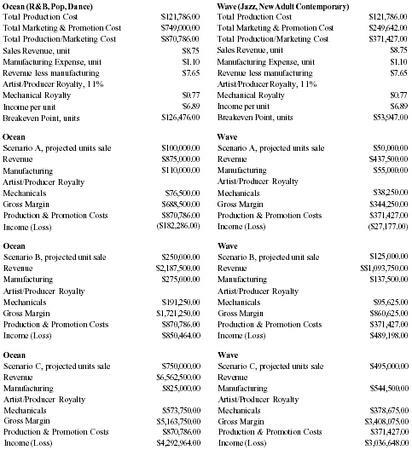 Cost of Goods Sold includes compact dist/cassette manufacturing (including printing), artist/producer royalty. 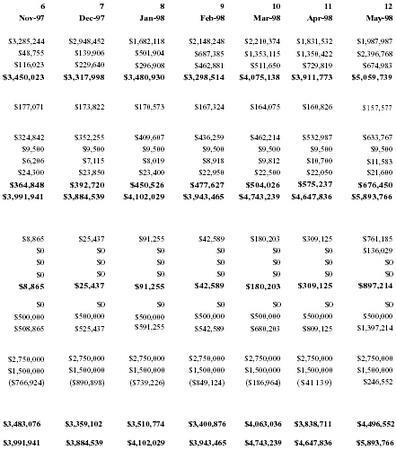 Artist/Producer royalties are calculated for only the unit sales occuring after the breakeven point has been surpassed. Why are the costs so high? Is this realistic? Who pays 650$ per day for studio time? That's too much.